(a) In Kowloon, literally the night is so young. I feel so at home. The moment I stepped in the Immigration I felt like I belong here. Heehee. Maybe, because sometimes I look like them. Just sometimes. (b) It’s cold here and I enjoyed observing the fashionistas. (c) I had roasted goose, crispy suckling pig and prawn noodles in Guangdong Barbecue Restaurant (which is actually not the barbecue type resto). It took half an hour for them to get my order, only the Manager knows how to speak English. Unbelievable. It’s making the process inefficient. 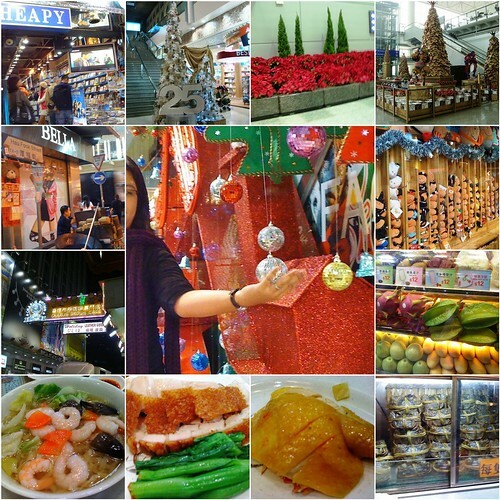 (d) More than enjoying the night market, I enthusiastically scouted the food hubs (in Tsim Shat Sui area only). Lots of, including Mc Donald’s, Pizza Hut and KFC. (e) Discounts in shopping flood. Several interesting stuff scouted but I didn’t buy. Yet. Too early. (f) Lots of kooky store names, “Hair Peace, etc.” There’s this cute store which sells various stuff. The one wherein my holding of christmas ball was taken. I think I’ll be back there. (g) I had Twilight relapse again. Saw a store called Bella, at the corner of Hau Foos Street (I almost read it as Forks Street. Ack!). On the other hand, I’m reminded of my favorite character (Snoopy) when I was younger when I saw Charlie Brown Cafe. (h) Fresh fruits are around as well as street food like chicken intestines, pirated stuff (especially DVDs), etc. Reminds me much of the Philippines. (i) Our sidetrip is per ‘do it your way’ basis. Hence, nothing is fixed. But of course, we have plans including contingency planning. Nerds. (j) Also in the collage are snapshots of Christmas trees in Dubai and Hong Kong Airport (plus the fresh poinsettias and little pine trees). (a) Looks like she doesn’t like me. But she was nice to me, I thought. (b) I don’t know her, by the way and anyway. (c) Maybe she doesn’t particularly like that I was drinking and she was not. (d) Whatdaheck (kidding!). I think this photo is candid and funny. I’m still adjusting with the four-hour time difference with UAE. I’m still hyperactive. Hence, this post. But I’m signing off in a while. I’ll try to catch up with bloghopping. 🙂 Happy weekend, everyone! 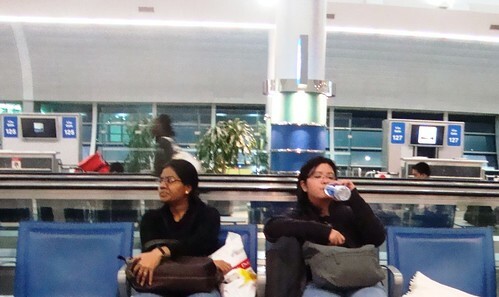 yeah, that lady looks annoyed by your drinking…were you making gulping sounds?…lol. wow, i love the pics. do enjoy and have fun with the shopping =). have a great weekend. enjoy your trip wits! hong kong is a very nice place. magshopping ka…he! he! haha funny pic, you can create a story out of that! have a safe trip jo. very funny picture. 🙂 maybe that girl wants to have some drink but she can’t ask from you. haha. hello there! salamat sa bisita nga pala sa twilight post ko, I didn’t know you were as obsessed as I ma lolz.. inadd nga pala kita sa blogroll ko, I made comments on som nice of your twilight posts, it’s nice talking to someone who loves the same things as you.. wow, you ar ein HK, I’ve never been there, dapat dyan honeymoon namin naudlot lang, we wanna save the money instead of travel hahaa 🙂 take care! !